When the travel industry went into a tailspin after 9/11, I lost my job as a senior assistant cruise director. Heartbroken over the fact that my days of traveling had come to an end, I wound up back at home, consoling myself with ice cream and chocolate-covered almonds. I was at my heaviest when I met my future husband, George Rajna. George had spent two years in the Peace Corps and was always looking for his next adventure. I quickly realized that it was time for me to get back in shape—for me, for him, and for all of the amazing trips we could take together. Read more of the article and more of my story in Traveling in Sin, our memoir. Just when the caterpillar thought her world was over, she became a butterfly.”I have always felt connected to science, transformation, and especially to the process by which fuzzy caterpillars become butterflies. Butterflies and their metamorphosis were even the focus of my Bat Mitzvah speech at the age of thirteen. I just did not realize it would take me three more decades to fill my own wings! Change has been good to me. I have been evolving from having a fixed mindset to a more growth-based model, and from a heavy, single girl unsure of what to do next, to a sassy skinny married one who is a traveler, teacher, blogger, now appearing in a major women’s magazine! Read the Full Article. On Saturday, September 29, 2012 KTLA’s “Career Day” will invite viewers in to science teacher Lisa Niver Rajna’s classroom and see first hand how she inspires her Kindergarten through sixth grade students by integrating science concepts in an engaging way that connects with our community. Being able to explain the Ho Chi Ming Trail, all about Nomads and Gers in Mongolia, as well water issues around the world with both photos and video from her personal perspective engages students of all ages. 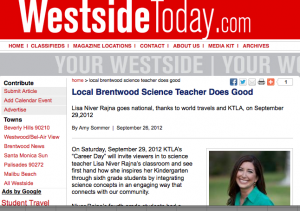 Find out how Lisa Niver Rajna does it on KTLA Saturday, September 29, 2012 at 1:00pm. Read the full article here. My whole life changed the day I walked across that street. On one side of the road I walked every day on the way to class stood medical school buildings (which kind of sucked), and on the other side the sounds of happy children shrieking and screaming on the swings and slides (much more appealing).I turned my back on the well-trodden secure road to success at an elite all-girls private school, the high towers of Ivy League college education, and a Top-Three medical school to become a volunteer assistant preschool teacher. I welcomed the great unknown, giving up the rat race and the race to nowhere simultaneously for what I couldn’t yet know would be the greatest adventure of my life, an e-ticket unlike any I’d ever imagined. I gave up sweating formaldehyde for cleaning spit. Read the Full Article. “I want each student to care and be passionate about her topic,” says Lisa, who has been using Science Buddies and the Topic Selection Wizard with students at Brawerman for several years. 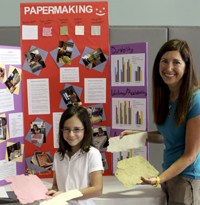 Making Real-world Connections For Lisa, tying science exploration to real-world events, issues, and problems is all part of the science, technology, engineering, and math (STEM) education process. In her classroom, science is not a standalone subject. Instead, Lisa teaches science as a subject that is connected to everything. “I work hard to make sure they see the connections between what we are studying in class and life outside the classroom,” says Lisa. Her classroom lessons and discussions include social issues, global concerns, and examples from other countries, steps she takes to broaden her students’ understanding and awareness of the world around them. “Making connections between science and real life as well as science and other subjects is a major focus of my teaching,” explains Lisa. “I integrate with art, library, and as many teachers as possible. Students need to see how science is connected to everything.” Read the entire article.